In this post I would like to talk about Remote Triggered Black Holing, a mechanism to protect a network by filtering malicious traffic at the edge. It’s a powerful tool ISPs can (and should) adopt to stop DDOS attacks on their networks. UPDATE 2009-06-21: You can find a related solution to use customer triggered blackholing in this new post! The network … backdoor command let you to prefer IGP over eBGP routing updates without changing the overall BGP administrative distance. Initially, R1 and R2 run an IGP (EIGRP) on the direct link (172.16.0.0/30). Look at D 192.168.2.0/24 [90/30720] via 172.16.0.2, 00:00:20, FastEthernet2/0. At this time, both R1 and R2 have an eBGP session with R3 and advertise their local networks: 192.168.1.0/24 and 192.168.2.0/24. Why? What appened? This is not an optimal routing plan! With BGP peering on, R3 receives R1 (and R2) networks, then it advertise them back to the other peer: the eBGP administrative distance is lower than IGP (EIGRP and others), so R2 (and R1) prefer the route through R3. To avoid this behaviour you can change BGP administrative distance with distance bgp command, but this is not recommended… or you can use the network backdoor command. The route is again reached via the local link! You can find on the .zip file 3 config versions (config subdir): “1. Interfaces and IP”, “2. 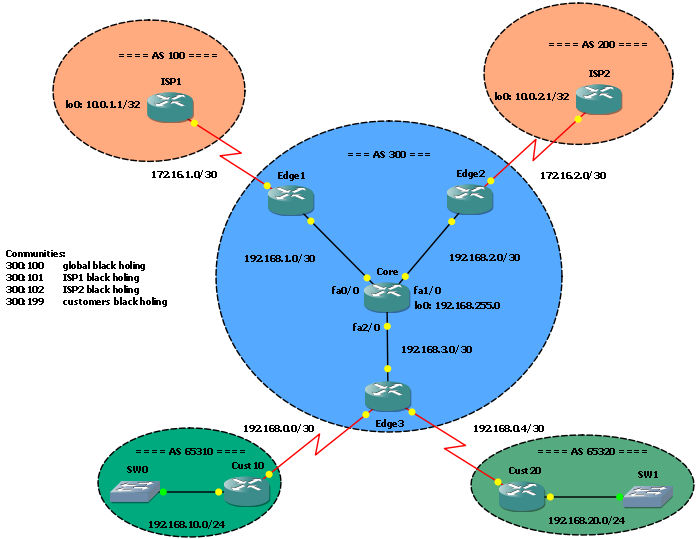 EIGRP + BGP” and the final configuration with the network … backdoor command. Recently I decided to deepen my knowledge of BGP and MPLS, so I started studying for CCIP certification, which cover both arguments. 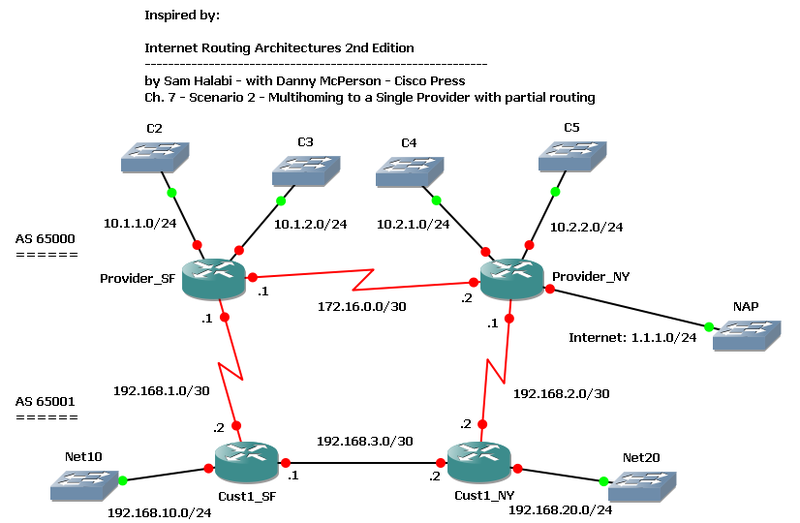 As suggested by many people I started with BGP “Internet Routing Architectures 2nd Edition”, by Sam Halabi, Cisco Press. It seems to be a really good book, and It contains a lot of scenarios, so I have though to build some GNS3 labs inspired by them. The first interesting one is on chapter 7, Scenario 2, and I tried to build a lab on it. We have a customer with 2 routers multihomed to a single provider: customer’s SF router is connected to provider’s SF router, customer NY router to provider NY router. Customer is in AS 65001, provider in AS 65000. Both customer and provider have an internal link connecting their routers. Provider has some other customers directly connected to its routers, and it’s connected to a NAP through the NY router. We want our customer to have an optimal routing table to reach both provider’s customers and the full Internet. As we can see, all routes are in the table, but an half of them is using a suboptimal path: remote subnets are reached via the local BGP peer, and this is not good for those directly connected to the other peer. For example, SF customer router should reach C4 and C5 via the internal path to NY router, and then through the Customer_NY-Provider_NY link. Suboptimal paths exist here too: customer’s routes are always reached via the local BGP peer. Cust1_SF receives C2 subnet (10.1.1.0/24) from Provider_SF (eBGP) and from Cust1_NY (iBGP). Both routes have the same value for all attributes, the only difference is the way they have been learnt: internal (iBGP) and external (eBGP). The BGP decision process picks the external one: this is the rule. Now it’s time to build an optimal routing table; we want to reach C2 and C3 subnets through SF provider’s router, C4 and C5 through NY router, and unknown destinations (1.1.1.0/24) via NY router too. We have wath we needed! But what’s up on the Provider’s side? Now our provider reaches our subnets in the way we need. 192.168.10.0 is the subnet locally connected to the provider’s router peer, so it has a low metric (200), but 192.168.20.0 is not, so it has a higher metric (300). Provider’s router prefers to reach that subnet via the internal link through the other iBGP peer, which receives the subnet with a lower metric (200) from it’s eBGP peer. On the lab .ZIP file you can find two configuration sets: base and final. The first contains just a base configuration with IP addresses and iBGP on the provider’s side. The final configuration contains all commands reported in this post. Often, surfing on networking forums and blogs, I find posts by people asking how to setup dual WAN connection and load-balancing on a single box. They are looking for solutions to have the LAN connected to Internet, VoIP traffic with an acceptable QoS level, most of them have to handle VPN tunnels and DMZ too! Of course, a good network architect would never consider such solution for this scenario, but when budget is low (or not exists at all) there are not many ways to have all these things running! In this catastrophic scenario Policy-based routing (PBR) can save us! 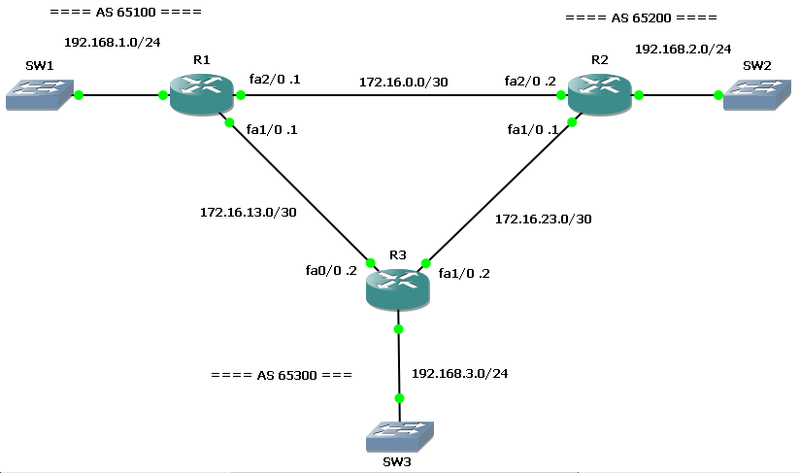 Here you can find a little PBR based solution and the GNS3 Lab. – a Gold link, with good performances, on which we have a /30 point-to-point subnet and an additional /24 routed subnet. Note that ISP does not accept inbound traffic coming from a subnet that is not the one routed through the ingress interface: for example, we can’t send traffic from 1.1.1.0/24 out the Bronze link. One subnet, one link. – our servers have to be reachable from the outside on their public IP addresses. For the sake of simplicity, in our example and lab mission critical traffic will be telnet traffic. In real life it can be RTP, database or other important traffic. At first sight, we can see there is no way to achieve Server farm fault tolerance: if the Gold link goes down, we can’t do anything to keep the subnet reachable. Ok, we can just tell the CIO to get a bigger budget for the network! Traffic coming from the LAN towards WAN or Mission Critical Services needs to be translated by NAT too: remember that in the order of operations a packet is first routed, then translated, so actually we can focus just on routing packets out the box in the right way. We will take care about NAT later. Standard routing just forwards packets on the basis of the destination network; it doesn’t care about Layer 4 properties nor source IP addresses. How can we route traffic on the basis of other elements, such as TCP destination port? If we want to route packets in the expected way we need to deploy Policy Based Routing(PBR). PBR, indeed, can take decisions on the basis of a lot of parameters: source address, destination ports, QoS marking. Let’s proceed in an orderly fashion. We just have WAN interfaces up and running and the fastethernet interfaces pointing to the right subnet. Now we need to start our PBR configuration! To do this, we need to create route-maps and then apply them to the ingress interfaces on which policy-based routed packets will enter. The access-list just matches telnet traffic that is not directed to our Server farm. If a packet doesn’t match any route-map match statement it’s routed on the basis of the standard routing table (so, through the Bronze link). Here our access-list does match traffic coming from the server farm to destinations outside the LAN: of course we don’t want to route ServerFarm-to-LAN traffic though the WAN! Unfortunately we can’t add a second interface to the set interface command: our ISP will not accept traffic coming from 1.1.1.0 on the bronze link. Routing is OK, let’s take care about NAT. Here we don’t have to think about “policy-based NAT”: when NATting, policies have already been applied, and packets routed accordingly. We just have to translate them in the right way! Both route-maps does match 192.168.0.0/24 traffic, but the first (NAT_Gold) takes care only of those packets routed through the s2/1 interface, while the second (NAT_Bronze) of packets routed through the Bronze interface. In this way we are sure the right inside global IP address will be used when translating. L2/L3 switching, VLan, HSRP, GLBP, spanning-tree, trunking, etherchannel, EIGRP, L2/L3 access switches, spanning vlan.